Finally a wearable for bass-face. Bass: It's music's final frontier. By that, I mean it's the part of music that needs to be done right. Too much, and songs sound like a mess. Too little, and there's no guts. Enter Basslet, from a company called Lofelt. In a nutshell, Basslet looks like a watch, but it actually houses a transponder that converts the low frequencies of your music into vibrations that "feel" like bass. It doesn't vibrate like a phone, though; it matches the music, so if bass rises from low to high pitch, you feel that sweep. It's a very unusual idea to grasp, but once you try it, you instantly get it. It's a little bonkers and also a lot of fun. The co-founders of Lofelt have both worked at two of the leading music software companies (Ableton and Native Instruments). They know bass and its importance in music (or at least, certain styles). This also isn't the first product to bring tactile bass out of the headphones and onto your skin. SubPac has been doing this for a while with its backpack and chair-friendly products. Tactile bass also has uses outside of music listening, of course. Gaming and VR are obvious examples, as are home theater and DJing. Anywhere you might want to add a little oomph to sound, without annoying your neighbors. The Basslet itself looks like a minimalist Swedish-design watch. 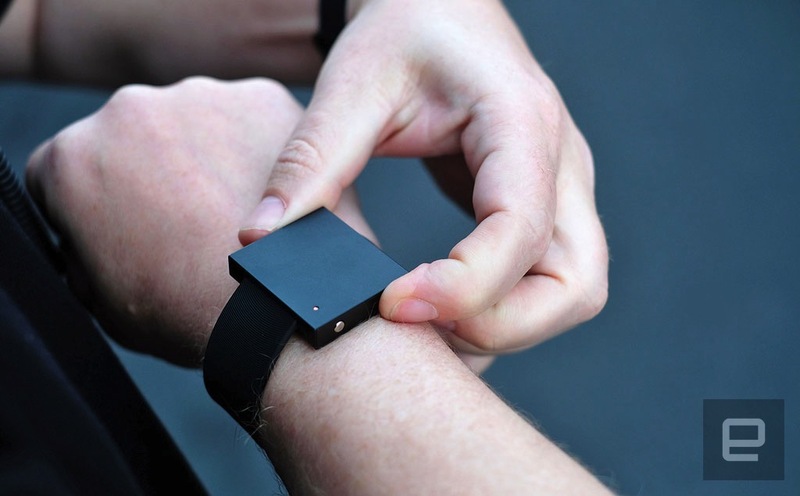 It's a blank, matte black square about a quarter-inch tall, with a simple rubber strap. There are two buttons on the side that act as "volume" controls, though it's really more "intensity" as there's no actual sound being produced, just the sensation of sound (think: when your ribs vibrate inside a loud club or car). Basslet is wireless -- to a point. You don't plug your headphones into it; instead there's a companion dongle for that. 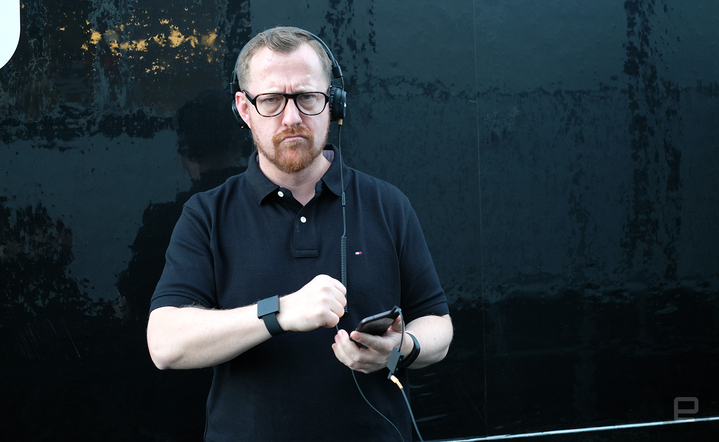 The wearable then communicates with the dongle providing the "bass" in real, or very near real, time. I occasionally sensed some latency. Not huge amounts, and it's hard to tell given the mix of senses in play, but when there's a lot going on in the song it can feel a little like a mush of vibrations, possibly due to the audio as much as anything else. Technically speaking, Basslet translates anything from about 10Hz to 250Hz into something you can feel. I love bass-heavy music, so this is a product that sings to me. (I love the SubPac too.) I imagine if your musical tastes are a little more... relaxed in the bass department, the idea of jacking up what is there might not make as much sense. The battery life is estimated to be between six and 12 hours, depending on how much you jack it up (for me, that's all the way, all the time). To enjoy the bass sensations, you need to fasten Basslet pretty tight. The problem is the rubber strap it comes with isn't the easiest to pull taut and clasp one-handed. I soon got the technique down, but some of my colleagues fumbled around for a few minutes trying to get it tight enough to work properly. The good news is, you can replace the strap with any conventional watch strap, meaning you can mix up the style, too. At $199, this is perhaps a hard sell to those bass heads who are happy with headphones of about the same cost. But, if you're someone who loves music for the "feels" and want to enhance it in a way that headphones could never, ever do, this is something you're going to love. With more than $600,000 raised through the Kickstarter campaign, there's plenty of people in that category. I'm certainly one of them. I already feel a little deflated every time I take it off. So I'm basically (bass-ically?) never going to.